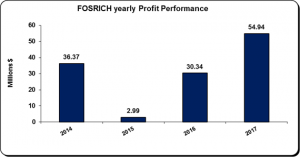 FosRich Company Limited (FOSRICH) for the three months ended March 31, 2018 booked an 8% decline in revenue to total $271.85 million compared to $294.51 million for the same period in 2017. Cost of sales for the year showed a reduction of 7%, moving from $155.51 million to $143.93 million. The Company noted, “These decreases were attributed primarily to product price movements. While volumes may be steady or increasing, product prices have seen some downward movement on the international markets.” Despite this decrease, gross profit amounted to $127.92 million, a contraction of 8% when compared to $139.00 million recorded last year. Administrative and other expenses fell by 12%, to total $96.23 million (2017: $109.40 million). This decrease was driven primarily by “efficiencies gained from the management of staff and related costs, selling and marketing expenses and insurance costs. There were increases in staff training, rent associated with the new lease for the adjacent Molynes Road facility and bank charges” the Company noted. Profit before taxation totalled $30.79 million, a 48% increase when compared to $20.78 million last year. As at March 31, 2018, total assets amounted to $1.35 billion, up $4% million from the balance of $1.30 billion as at March 31, 2018. The increase in total assets was as a result of ‘Due from Related Parties’ and ‘Inventories’ which totalled $202.16 million (2017: $124.97 million) and $709.70 million (2017: $625.06 million). Shareholders’ Equity of $639.76 million was reported as at March 31, 2018 (2016: $357.13 million) which resulted in a book value per share of $1.27 (2017: $1.21).